Note: This article was written for an early version of JavaFX and I have good reason to believe it does not work in later versions. I wrote this shortly after the first release of JavaFX. Several years passed and I became an Oracle employee via acquisition. So I need to say in no uncertain terms that this article represents my own opinion and does not in any way represent an official position from Oracle. 100% personal opinion, 0% Oracle opinion. I hope that's clear. I want to like JavaFX, really I do. The return of the applet reminds me of the 90s which is nice. I also like the idea of being able to drag an applet into Windows, Ubuntu, and Mac to run it as a desktop application. It's a whole new take on their "write once, run anywhere" promise and breathing some life into a platform that needs it. Java used to be so trendy and cool, it was the "Ruby on Rails of the 90s" now it's seemingly destined to be the "COBOL of the 20s". If JavaFX lives up to its promise it could turn things around. 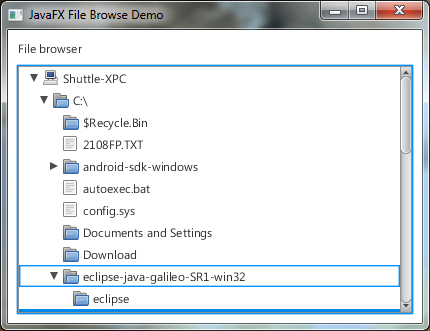 So far though I've been a little disappointed with JavaFX. It's like an El Camino, a strange combination of AWT and Swing that doesn't quite feel natural. I'm going to keep trying it anyway and hope that one day it catches up to C# 1.0. Look, I know this sounds terribly cynical so far but you have to believe me when I say I'm trying to like it. The reality is, even if JavaFX is a little clunky now it's still a considerable improvement over Swing. Over the next few months I'm going to upgrade all my ugly Swing applications to JavaFX. The first one is something called Debigulator. It's a batch archive program that I wrote for myself but has been downloaded more than I expected. Besides being unattractive it also doesn't resize well. JavaFX addresses both of those so I'm porting it. The first thing to go is that awful file browser in the top left region, I'm embarrassed to look at it. I think I'll replace it with a simple TreeView. Next we want to set the icon, full path, and isDirectory members. This would be a good time to mention that all the icons in this demo come from the Tango library. Now let's add the event handler for the node expanded event. That check for source.isExpanded() sure seems unnecessary. Man that was a fun piece of unexpected behavior to track down. We'll wrap up this TreeItem implementation with an handler for the node collapsed event. Again the source.isExpanded() check really shouldn't be needed but just go ahead and remove it to see the goofiness that follows. Now we can go to work on the main program. Here's all the basic stuff. Now it's time to start populating the tree. We'll use the computer name as the root node. Although I might go back and hide the root node since it's kind of pointless for this application. It's really just showing off how to get the name from the InetAddress class which you either already knew or didn't care about. One nifty addition to JDK7 is the ability to list all the drives on the system. That comes in handy for the next step where we need to add all the drives under the root node. All that's left is to add the TreeView to the window and show it.